Day 5b – Nov. 3rd, – Land AHOY! Jacksonville Florida here we come! We continued sailing the next morning under grey skies, and moderately heavy weather. Compared to the night before, it was very manageable. The winds were about 20 to 25 knots with large seas the had built up the night before. We were making good speed to land fall, about 7-8 knots the entire day. At some point last night, we decided to slightly alter course to Jacksonville rather than St. Augustine’s Florida. The difference was only about 17 miles, but would mean arriving at the harbour mouth at 8PM rather than 10-11PM that evening. Paul also noted that the St. Augustine’s harbour entrance was a small shallow recreational entrance, where the Jacksonville entrance was a large commercial shipping entrance. In the weather we were sailing, with reduced visibility, large swells and waves would make it much safer and easier to enter at Jacksonville. Ed cooking up a nice stir fry dinner. Much happier now that dinner is ready! At about 7PM we were very close to the harbour entrance, the sun had set, and it was quite dark. There was a lot of container ship and commercial fishing traffic in the area. We could count about 6-7 container ships on the AIS screen, plus another 3 vessels that we tracked visually that did not appear on the AIS. I would highly recommend AIS to anyone contemplating it. It’s really not that expensive, no monthly fee, and draws virtually no power at all. It basically runs on your VHF radio and chart plotter, so no additional power is consumed. It gave us added confidence in what we were seeing, and would answer questions like; Which direction is that boat traveling? What speed? Are we on a collision course? It also showed us that a couple of boats were anchored near the harbour mouth. The seas look a lot worse in person. Click to enlarge. Later we heard radio traffic between the harbour pilot and the container ship Captains. The anchored boats were waiting for the harbour pilot to come out and guide them in. We also heard from a large container ship that went out earlier that day from Jacksonville headed to Texas. He decided to head back into harbour due to the tropical storm he encountered, and decided it was too rough for his ship. Oddly enough this was the same storm we endured the night before. Wild, our 39 foot boat handled a storm that a container ship did not want to contend with. To be fair, we had the storm behind us, and we were running from it, with the waves behind us. The container ship would have had it right on his nose, but in any case we felt good about making it through. Soon after the call, we were hailed by the harbour pilot, who also acts as traffic control. He had a few questions for us, like what direction we were approaching from, and if we were headed for the sea bouy about 1/2 mile from the red and green bouys that mark the entrance that would guide us in behind the sea wall. He also wanted to know where we were coming from, when I responded New York City, non-stop, he was pretty impressed. We made a text book approach to the sea bouy on a beam reach, then we veered to a close haul toward the entrance, furled in the head sail, and turned on the engine, and continued down the channel. We could see large seas crashing against the sea wall were now behind. It felt good to motor in calm water for a change. The harbour pilot hailed us once more, he was piloting a 1000 foot container ship right behind us. He asked us to move to one side of the channel so he could pass. We asked which side he would like us to keep to? He responded that we could choose, and he would pass on the opposite side. The pilot and other ships in the area treated us with respect and courtesy, even though we were just a 39 foot sail boat entering a major shipping lane. It was an awesome site to have such a large ship pass us within about a 100 feet. 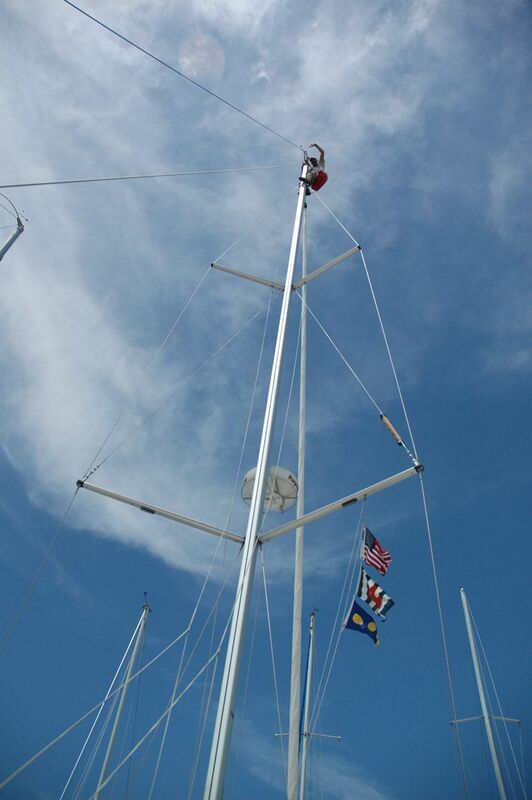 Our 60 foot mast did not even come close to reaching the height of the decks of this ship. At this point we were winding up the river, while I was searching for a suitable marina to tie up to for the night. I found the inter-coastal water way (ICW) on the charts, and a few marinas about 3-4 miles down the river. 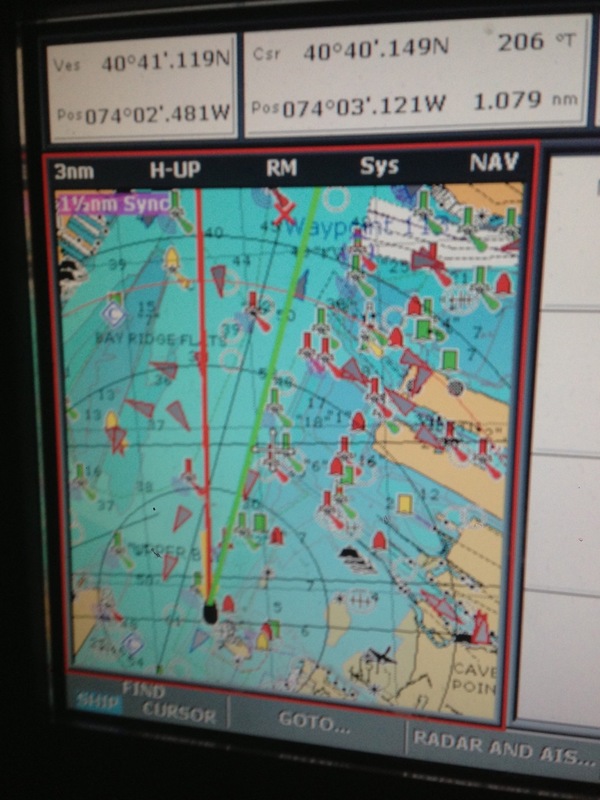 Navigating the ICW at night reminded me about the difficulties we had in the Erie canal on the way down earlier. We were trying to keep between the markers, assisted by the chart plotter and looking for them with our 3 million candle light. The bridges are suppose to have 65 feet of clearance in this part of the ICW. Our clearance with the instruments is about 62 feet. As we approached one of the bridges we noticed the marker on the side of the bridge was showing only 62 feet as the tides were high. I was not certain we would clear the bridge, and attempted to slow the boat down, and eventaully had the throttle in full reverse but the boat was not coming to a complete stop. With the tides still coming in, there was a 5-6 knot current in the river. The boat shifted side ways when the current got a hold of the keel, and she kept moving forward and under the bridge — side ways. At this point you might want to call me sideways Eddie. We drifted under the bridge side ways, only a few feet of clearance on each side of the bridge. Reminiscent of the lock we went through side ways and back wards in the Erie Canal. If you want to read about that experience, click on this link. I learned something from the lock experience, and did not panic this time, kept cool, and gently played the throttle so as not to hit the bow or stern on the bridge supports as we drifted through. The crew was ready to fend off, I kept my eyes on the bow and stern, and did not worry about the mast, there was nothing we could do about that. Luckily, we made it through without any damage, but must have been within inches from the mast height, and a few feet from the bow and stern. Paul was very relaxed about the whole thing, “Told you there was enough clearance, nothing to panic about.” I was relatively calm too, starting to get a few notches of experience under my belt now. Had I not had the lock experience, I would have panicked, and could have damaged the boat again. Upon reflection of what had just happened, it was actually a good thing we drifted side ways. Had there not been enough mast height clearance, the boat would have heeled and drifted on through. We would have suffered greater damage going through straight on. Once we landed at the Palm Cove Marina gas dock, we were so happy to step foot on solid ground, that Peter, Cez and I all literally kissed the ground as we got off. It had taken us exactly 5 days and 3 hours to travel close to 1,000 miles, about 1,800 kms. What I keep referring to as probably a cruisers record! The next day we attended to the boat, hosed down the salt with fresh water, pumped out, fueled up and charged the batteries. The boat made the voyage with no damage, or failures to the rigging or electronics. However, we did noticed one small thing when we landed, a bolt missing from the roller furling. It was not a threat to the rig, and the furling still worked despite the missing bolt. The Marina is actually very nice and modern, so I decided to leave the boat here for a few weeks. They have all the facilities you would want; Concrete floating dock that rise and fall with the tide, laundry, Wi-Fi, restaurants and a swimming pool. It is located conveniently on Highway US 90 and near the A1A, close to all the action by the beach. I thought the cost was reasonable at $550 for a whole month. That evening we had a very nice dinner on the A1A beach strip. We decided to have appetizers at one place, dinner at another and desert at yet another. The first place was famous for mussels, so I asked the chef to surprise us with 2 mussel dishes done how ever he saw fit. We had probably the best two mussel dishes any of us had ever had, along with a cheese tasting platter. The next day the crew flew out, I stayed an additional day just to further clean and prepare the boat for it’s 3 week stay. I flew out the second morning, but can’t wait to be back in 3 weeks with Roxane and the boys. We plan to then sail down the coast to Fort Lauderdale, and then over the Gulf Stream to the Bahamas, where we hope to spend the next 6 weeks and Christmas. Captain Ed, Signing off for now, please check back in the first week of December, 2008. I was pumped for you guys all week. I could not believe how fast you made it. That is great everone is safe, I am sure all are better sailors as a result. Ed, You sure embraced the sport! Previous story Day 5a – 36 Hour Tropical Storm!